While DC has announced more line-wide variant covers for September, tying into the release of weekly series Futures End, and Valiant have announced the return of chrome covers for their Armor Hunters event, the current cover gimmick I'm tired of most at the moment are the Skottie Young variants Marvel has been pumping out. Now don't get me wrong, Skottie Young is easily one of the best artists in the game. His expressive pencils bring a movement, humour and fluidity to whatever he draws that few can match, and a style none can compare with - but like Punisher in the 90's, the amount of times it appears, takes away from making it feel as special as it should. Just look at Marvel's OZ if you need any proof. 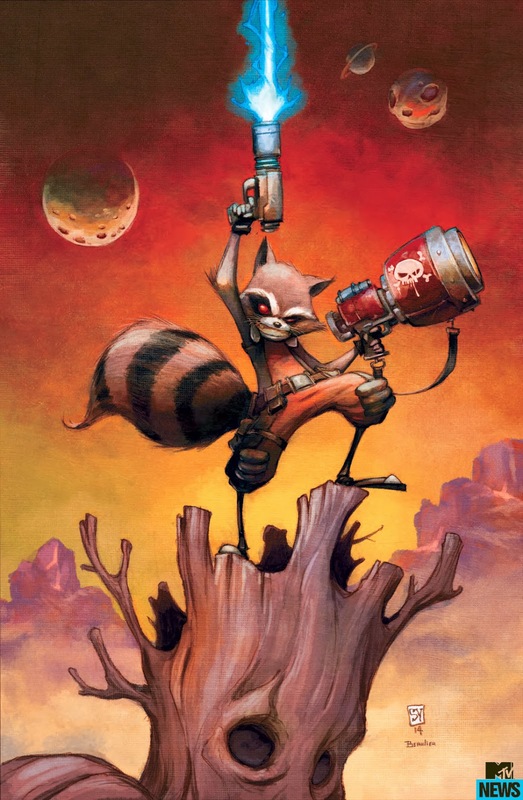 Now revealed on MTV News, Skottie has been placed as writer and artist on the upcoming series for Marvel's 'money in the bank' character of 2014; Rocket Raccoon. Hopefully this becomes one of the sole sources of Skottie's work, because if there's one person who can draw the humour and facial expressions of the character like co-creator Keith Giffen, it's Young. "I think it's going to have a connection to that nostalgic feeling for Looney Tunes, that old animated flavor where everything wasn't squeaky clean, you know? Daffy Duck would get his bill blasted off with double barrel shotguns... That's what I grew up watching, and being able to play around with that in this hyper-superhero intergalactic universe will be a lot of fun." I had mixed feelings on those Oz comics... I mean- his art is great- and it REALLY fit that world... But I already own the books. -I wish they hadn't just used that text so much. I really enjoyed the Oz comics Caliber put out in 1994. As for this- I like Rocket better when he's presented a bit more seriously. I don't want to see Looney Tunes Rocket. Thanks King - I'm trying to remember where I first ran into Skottie's art and I can't figure out where that was. I was a pretty frequent visitor to his blog for ages... I think it might have been the Human Torch solo series, but something tells me it was even before that. I still have a lot of my collection in storage from moving countries, so when I unpack, the answer will be mine!